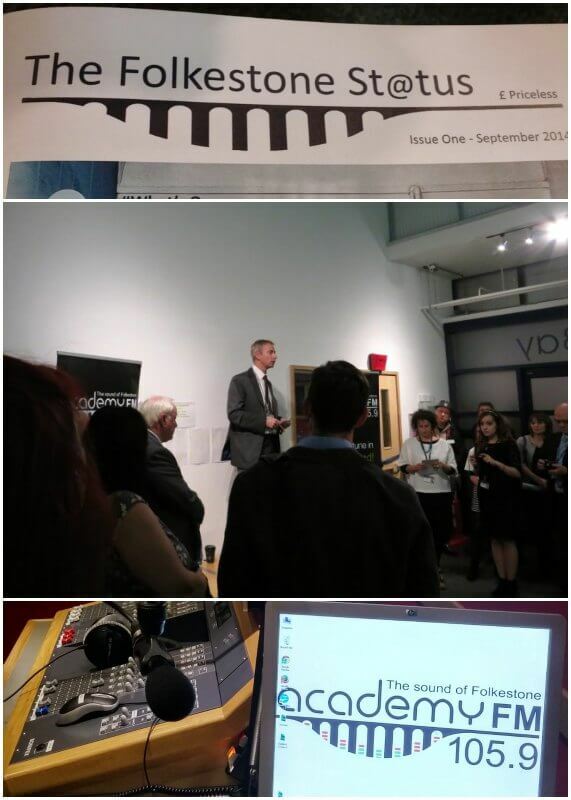 We were delighted to be invited to the official launch party for the new Folkestone Status magazine, which was combined with the opening of Academy FM’s new Glassworks studio. The Folkestone Status is a free magazine, published every two months, and is designed to promote local events and keep local people informed with current affairs in Folkestone. There are so many events happening all the time in the town but it’s surprising how few people know about them. “The educational side of this project is really important. Young people have opinions and they have a right to express them. By teaching Folkestone teenagers to review local events/exhibitions/theatre/gigs/restaurants not only will it improve their literacy and communication skills but it also engages them with what is happening in their own town – and gives them the opportunity to see new things that they may never consider available to them. They are of course Folkestone’s future. It’s great to hear of opportunities for young people in Folkestone. Sarah added, “It is a pleasure to work alongside the community in Folkestone and promote all the fantastic things that happen.” We’re very proud of our little seaside town. It’s a super place to live and work. Academy FM, ‘The sound of Folkestone‘, is a community radio station based at the Folkestone Academy school. Many young people help with the radio station and are trained in radio production whilst improving their communication skills and self-confidence. Station manager, Dave Sharp, told the attendees at the launch party that he wants to increase spoken content on Academy FM and continue the community focus. The new studio, within the Academy’s Sixth Form Centre, provides a second radio studio from which the station can be broadcast. Local businesses helped to build and kit out the studio. The new studio was officially opened by Councillor David Monk, who is leader of Shepway District Council. The ribbon was cut to applause from the party goers who were enjoying juice cocktails, and very tasty nibbles from Ampersand Design Cafe. This new cafe on Tontine Street has been reviewed by Folkestone Status. We wish The Folkestone Status the best of luck, and look forward to reading future issues.